KIEV --- Kick-starting the modernisation of Ukraine’s helicopter fleet, Airbus Helicopters has delivered the first two H225s, out of an order for 21 aircraft, to the Ukrainian Ministry of Interior. One aircraft is destined for search and rescue missions and the other one will be operated by the National Guard for law enforcement missions. The H225 helicopters were repurposed to suit these public service missions in just over three months. Another two H225s will join the fleet in the coming weeks. “Further to the Intergovernmental Agreement signed between Ukraine and France earlier this year, we are pleased to be celebrating the first deliveries. This Agreement for 55 helicopters enables Ukraine to provide its population with a complete range of helicopter services from search and rescue, emergency medical services, firefighting to law enforcement missions,” said Arsen Avakov, Minister of Internal Affairs of Ukraine. “Thanks to the excellent operational cooperation with Airbus, we will also set up a local training and maintenance centre in Ukraine to support our new modernized fleet of helicopters” he added. “We are pleased that these two H225s have landed in Ukraine in a record amount of time. Now that the pilots have completed their H225 certification training in France, Ukraine can immediately take advantage of the excellent payload and range that the multi-purpose H225 offers along with the aircraft's state-of-the-art autopilot that provides precision while reducing crew workload in the most demanding mission conditions,” said Matthieu Louvot, Executive Vice President for Support and Services at Airbus Helicopters who attended the delivery ceremony in Kiev. “One of the next steps is to accompany the Ministry of Interior in setting-up a dedicated training and maintenance centre for the helicopters in Ukraine,” he added. 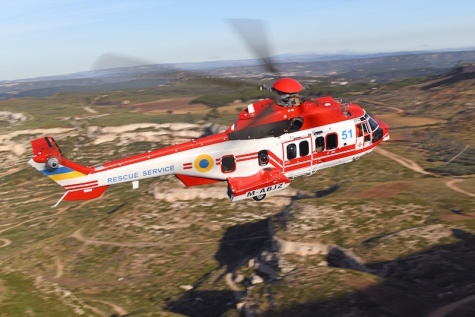 The first deliveries have taken place in the frame of the Intergovernmental Agreement contract signed in July 2018 for 55 aircraft – 21 repurposed H225s, 10 brand-new H145s, and 24 H125s, all aimed for search and rescue (SAR), EMS and other public service missions. The 11-tonne-category twin-turbine H225 is recognised as a reference in SAR operations and is relied on by organisations worldwide including the Japan Coast Guard, the Spanish Coast Guard and the Argentine Coast Guard. Benefits for these demanding missions include a takeoff sequence of less than five minutes, its all-weather capability including in full icing conditions, its SAR modes and renowned autopilot precision. The H225 offers outstanding endurance and fast cruise speed, and can be fitted with a wide range of mission equipment to suit any role. The H225 family has accumulated over 640,000 flight hours to date.